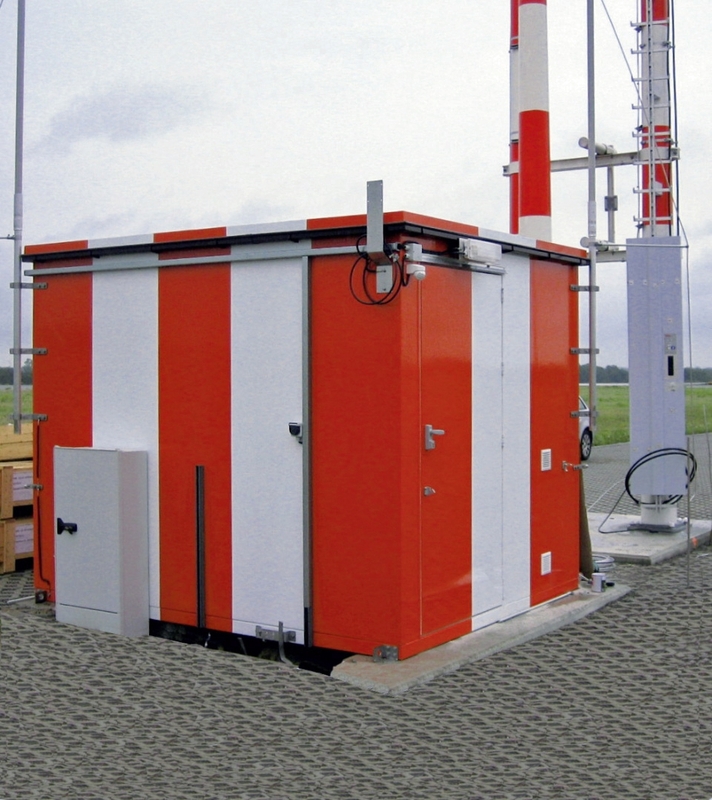 November 26, 2012 --- Intertec has won an order from Europoles for special-purpose field equipment shelters to protect vital airside navigational equipment at Kassel Airport in Germany, which is currently undergoing major expansion including a new runway. The International Civil Aviation Organization (ICAO) stipulates that any structure sited within 60 metres either side of the runway centre line or approach paths must be fully frangible to comply with safety regulations. These types of structures typically include masts and control cabinets for antennas and runway approach lights, and are designed to break or collapse in the event of an aircraft collision, to help protect passengers by preventing serious damage to the aircraft. The ICAO’s frangibility guidelines are mandated by numerous national aviation authorities, including Germany’s air traffic control company (Deutsche Flugsicherung, or DFS), the UK’s Civil Aviation Authority (CAA) and the USA’s Federal Aviation Administration (FAA). Although most electronic communication and navigation equipment is usually sited outside an airport’s operational area, the localizer and glide path transmitters and antennas of an instrument landing system (ILS) are exceptions. The localizer antennas are sited beneath the runway approach path, while the glide path antennas are positioned to one side of the runway, adjacent to the touchdown zone. Due to the high frequencies involved, to minimise cable losses the localizer and glide path transmitters are co-located with their respective antennas, and their environmental protection shelters therefore need to be frangible. All the frangible poles, antenna masts and associated structures for Kassel Airport’s expansion are being supplied by the European market leader Europoles. It chose Intertec frangible shelters for the project primarily on the strength of product quality. Intertec has supplied Europoles with conventional and frangible field equipment shelters for a number of airport projects in Germany, including Wunstorf Airport, near Hannover; the quality, performance and corrosion resistance of the shelter for this installation so impressed Kassel Airport’s operators that they stipulated similar models. Intertec is supplying four custom-built frangible shelters in total for the Kassel Airport installation. The main material used to build the shelters is glass fibre reinforced polyester (GRP) sheeting, enclosing a polyurethane foam core which provides a very high level of insulation from the outside temperatures. This is the same basic technique that Intertec uses in its Arctic range of field equipment shelters for harsh environments. The shelters feature one-piece roof and wall panels with reinforced edges, held together by adhesive and screws to form a very rigid structure with excellent stability in strong winds. No metal reinforcing components are used in the shelters’ construction, other than a steel floor. The lightweight fabrication material has a very high tensile strength, but will break quickly and cleanly when subjected to a high impact force from the side. Located in the centre of Germany, with high speed rail and road links to virtually every major city in the country, Kassel Airport is undergoing significant expansion. Due for completion in Spring 2013, the airport will feature a new 2,500 metre runway – 1000 metres longer than its predecessor – and a completely new support infrastructure that includes a 35 metre control tower and a terminal that can be expanded to handle up to 3 million passengers a year. As part of the expansion, the airport is being equipped with a Category III Instrument Landing System (ILS) for all-weather operation, enabling aircraft to land even when conditions such as fog or snow severely limit pilots’ visibility. The ground-based sub-systems of the ILS transmit radio signals that are interpreted by the approaching aircraft’s ILS receiver, to provide the pilot with precision runway centreline, angle-of-descent and touchdown position guidance. To maximise flexibility and operational efficiency, Kassel Airport will have two localizer sub-systems and two glide path sub-systems, enabling aircraft to approach and land from either end of the runway. Each of the four separate installations will comprise a transmitter plus associated control and monitoring equipment housed in an Intertec frangible shelter, together with a set of antennas mounted on frangible masts produced by Europoles. Intertec has extensive experience in the design and production of non-metal shelters for housing field equipment at airports, including frangible models for equipment sited within operational areas. The company manufactures many of its enclosures and shelters from GRP, and has built up considerable expertise in this specialist material. Europoles helps companies throughout the world to solve their infrastructure and construction challenges with extra safety and quality. As market leader in Europe, the company offers standard and special solutions for poles, masts, columns, towers, and other carrier systems made of steel, concrete, and FRP (fiberglass-reinforced plastic). Headquartered in Neumarkt, Bavaria, Europoles is an international company with production plants in Algeria, Germany, Oman, Poland, and Switzerland - plus a large network of regional offices and partners around the world. Europoles is part of VTC Industrieholding GmbH, an independent, medium-sized industrial group with headquarters in Munich, employing more than 1,000 employees worldwide. 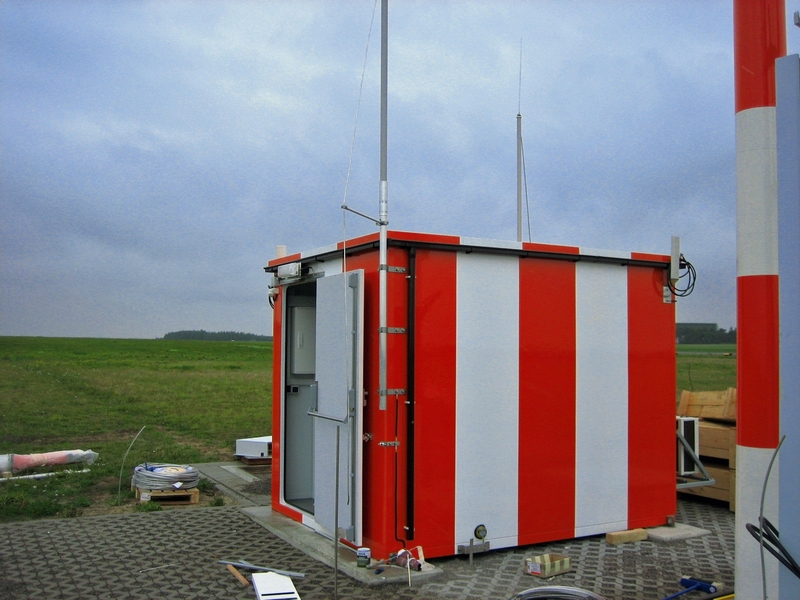 Intertec is supplying four frangible shelters to house ILS localizer and glide path transmitters at Kassel Airport in Germany.